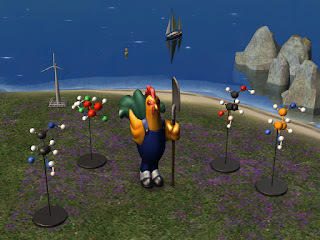 I received an email asking for the Chickenfeed Charlie Sculpture of Fun from Seasons and the "Hydrogens and Oxygens" by Modulin from FreeTime to be made into Hood Deco. Never made Hood Deco before but thought I would give it a go. There are 5 objects, 4 MoleculeTech and 1 Tacky Chicken. As far as I know these are base game compatible, no EP's or SP's required! Files have been compressed and checked in game. A screenshot is included in the zip file. so it can be fixed and I do not make the same mistake in the future. I do this for pleasure, not for profit. DO NOT re-upload to pay sites and DO NOT claim any of my work as your own. You can find more of my work at Leefish, Mod The Sims & Plumb Bob Keep.